"Series City" special Twilight magazine. cool french magazine all on twilight, with great looking posters in it. 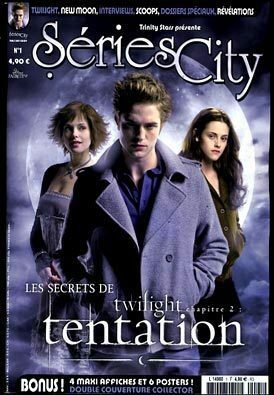 Wallpaper and background images in the crepúsculo la película club tagged: twilight french magazine french magazine series city. This crepúsculo la película photo contains animado, cómic, manga, historieta, anime, and dibujos animados. There might also be retrato, tiro en la cabeza, primer, headshot, primer plano, en la cabeza, and closeup.